This is part two of a three part series. If you're still preparing to apply and have read ahead, check out part one, 5 Things to Make Your SLP Graduate School Application Stand Out, and if you're ready to get ahead of the game, check out part three, 5 Things to Do to Prepare for Your First Clinical Placement as an SLP Graduate Student! You did it! You got in! But wait, now what? Once the excitement of reading the acceptance letter from your dream, distance graduate program settles, you’re left wondering what to do next. The thought of preparing for a graduate program can seem daunting, especially a distance program, but don’t worry because we’ve compiled a list of 10 things to do before you start that will help you have a successful first semester. As a distance student, we don’t have physical spaces (like classrooms or labs) where we meet. It is our responsibility to create our own learning environment. Some of us may have an entire office space dedicated to school but others may have a small corner of a room to use. Either way, make that space comfortable and organized because you will be spending a lot of time there! Having a designated school space will lessen the chance of you sitting in your bed writing papers and will help your brain to know when to switch into “school” mode. This one is so important! As a distance learner, you might not have the opportunity to meet your classmates face to face. It’s still vital to build some kind of relationship with them. I created a Facebook group for my distance learning cohort and offered the link at orientation, so everyone knew about it. We use that platform to ask each other questions about assignments, treatment plans, and sometimes to just talk about things that we’re going through as graduate students. Don't forget to ask questions of faculty members as well! Our friends at NewGradOccupationalTherapy put together some tips for communicating with faculty! As an online speech pathology graduate student, it is your responsibility to get a study schedule in place. You don’t have “class time” set aside to work on assignments, readings, and projects. The earlier you sit down with your calendar and designate certain days/times to do your coursework the better off you’ll be. NewGradPhysicalTherapy has 10 great steps to help with that work-life balance during grad school. Treat your coursework time as it if were a dentist appointment or business meeting. You wouldn’t skip out on those, so don’t skip out on your scheduled school time! You need to go into the semester knowing how you are going to keep track of assignment due dates, exams, and projects deadlines. I use a digital planning system, which you can read about here. At the beginning of each semester, I collect all of my course syllabi and put every single deadline for each course in my planner. That leaves no room for unexpected surprises, and it allows you to see your semester at a glance. Some of us need days to read and digest a few chapters while others of us can skim a chapter in 20 minutes and repeat the information verbatim. Since you’re in a master’s program, I’m assuming that you adopted solid study habits in undergrad. Spend some time really reflecting on what habits worked for you and implement those from the get-go of your graduate program. I had a binder during undergrad where I stored all of the important notes from each course I took. In the months leading up to the start of my graduate program, I made sure to review the notes so that I went into the first few weeks of classes with a fresh mind and the brain fog of summer lifted. I was mentally prepared to start digging into graduate level coursework because I reviewed my undergraduate notes. From the beginning of your program, you will start to collect resources that you will be able to use throughout your career as a speech-language pathologist. Consider starting a resource binder to house all of these materials in. I share a peek into my resource binder in this video. As an online student, having reliable technology is one of the most important things to consider tackling before your program starts. You need a dependable laptop, a solid pair of headphones, a microphone (unless your laptop has one built in), and a good Wi-Fi connection. It’s best to take care of these things before your program starts so that you do not have to worry about any of your technology giving out mid-semester. A lot of people prefer texting or emailing to talking on the phone. Well, I have some words of wisdom for soon-to-be online graduate students: get over it. Sometimes a phone call is necessary because it can be more efficient than emailing back and forth. As a distance student, it is not likely that you will be on campus to stop in and meet with your advisors and professors during office hours. You have to be willing and open to making and receiving professional phone calls. Once your program starts, even though it is online, prepare for the majority of your time to be spent reading, doing assignments, and attending class meetings (yes, some online programs do have live meetings – they are just online). Try to spend the time leading up to your program doing things that rejuvenate you, and if you want to take it a step further, get a self-care routine in place so you can carry that into the start of your program. Grad school does take up a ton of time, and it isn't always glamorous when anxiety might set in, but that is no excuse to let your self-care fall to the wayside. You’ve got to take care of yourself from the inside out in order to be the best graduate student clinician that you can be. 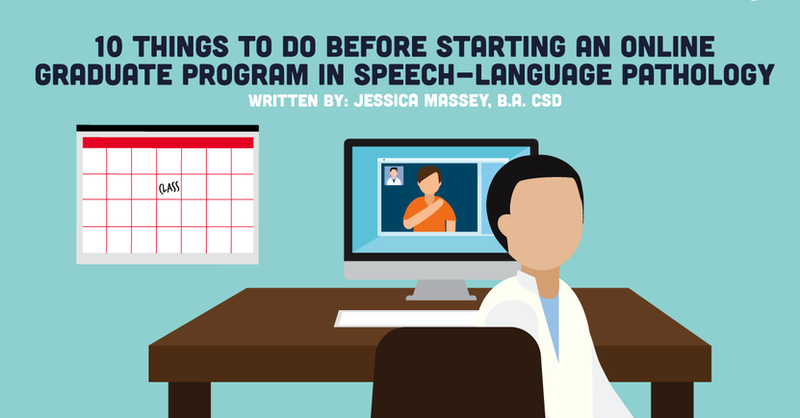 Starting an online master’s program in speech-language pathology can seem daunting, but if you put these 10 things into action you will go into your first semester feeling prepared and ready to succeed!